There has been an indictment of the youth in recent years for not voting. They talk, they start hashtags, but they don’t go out and do the important work – voting. This is often used to explain why certain elections have turned out the way they have, but is it true? It’s hard to say, exactly, and inevitably there’s many factors that play into the results of major elections, but in examining the Brexit and Catalonia referendum’s I hope to find a stronger conclusion. Brexit only won by a small margin. 48% voted Remain while 52% vote Leave. This wasn’t a landslide victory. When looking at the demographics of those who voted, it’s a reasonable estimate to say that about 73% of the youth under 24 who voted, voted to Remain in the EU referendum (Panjwani, 2018). In May of 2016, an article reported that just about 43% of people under 24 voted at all, while 78% of people over 65 showed up and 60% of those people voted to Leave. The article posits that young people who have high levels of political engagement often distrust the government more. Anecdotally, that seems to be true – even in my experience I know of people who’ve waived their right to vote in protest of not having a perfect option. I didn’t even know you could show up and just say ‘no’ – I assumed most people who didn’t want to vote stayed home (Barford, 2017). In July of 2016, another article said that they were wrong. They said that 64% of people under 24 voted and 90% of people over 65. What does this mean for the results? (Helm, 2016). 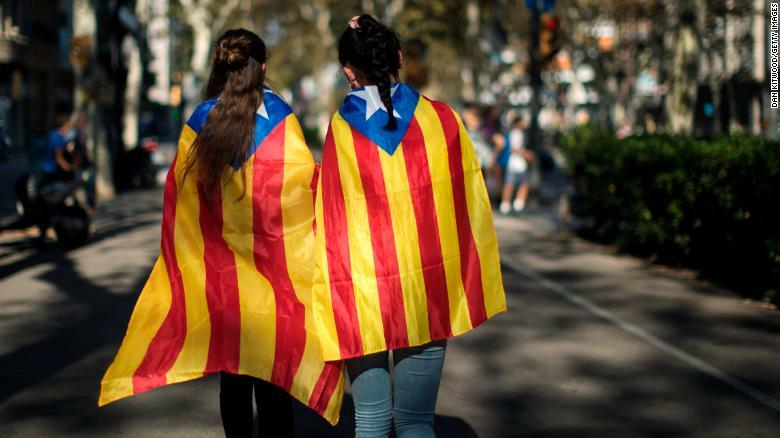 There was a huge youth movement in Catalonia, often dubbed the ‘Smile Revolution’. They had festivals and marches and various protests. The article presents the story of a teacher doing a teach-in and telling their students about civil rights leaders in America, like Martin Luther King Jr., and encouraging them to sit-in polling places because they cannot be arrested (Booth, 2017). I could find that while people were arrested, I could find no figures on how many or what had happened – if they were released or charged. “It is true that young people nowadays have other forms of participation and mobilization compared to other generations – social networks provide many tools to do so, and they also provide an audience who will listen and see their claims, so young people might not feel a strong need to go out on the street anymore – but I think that the youth are always the spearhead of society, and I believe that whenever it is the case, we are mobilized,” Pol Girbal, a 23 year old communications secretary for JERC since 2012, a left-leaning political party. It is one of the main political parties ruling Catalonia currently (Dominioni, 2017). Taking Twitter as an example, the site has over 15 million active users in the UK and more than 65% of these users are aged under 34, therefore making the site one of the most powerful in targeting younger audiences (Silver, 2016). More young people appear to be trying to take back the result than appeared to be campaigning for the Remain campaign (Miller, 2016). Do young people actually want to cause change? If Miller was right and more young people are trying to take back the result than were trying to campaign in the first place, I would say yes, even if he concludes this means they don’t care as much. It might not have worked out in Brexit, but I think that these sorts of events have shaped political activism on Social Media in the years following. People seek out political conversation on social media. It’s inevitable, and necessary for anyone who wants to know what’s going on. In America especially it’s become relevant to inform the people and mobilize. Twitter and Facebook have been responsible for things like Black Lives Matter and the #MeToo movement, but they’re equally responsible for facilitating Neo-Nazi’s and hate speech. We’ve known for a long time that social media can affect change. Whether it is positive or negative has yet to be seen. Previous Previous post: You’ll NEVER believe the Secret Trick of news!